Milk masala is an aromatic dry powder that is added to milk to make it more flavorful and better tasting. 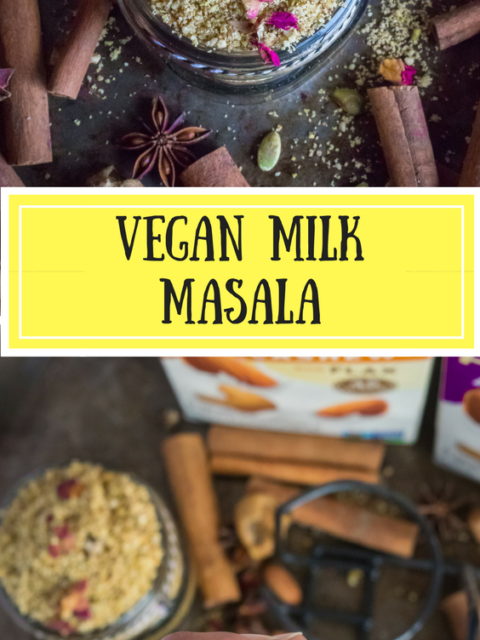 This milk masala is made with different dry fruits and spices like almonds, cashews, saffron, pistachios, peppercorns, etc. This masala doodh/milk is best for winters and is often consumed warm. 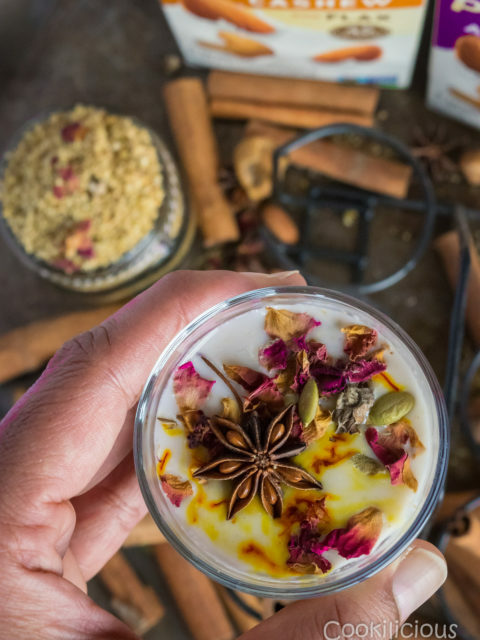 Growing up, Masala Doodh was a luxury drink. Dry fruits in India have always been an expensive buy and back then only the upper class could afford them. Our next door neighbor was one of them. It was like a second home for me. I loved spending my time with them because I used to be pampered a lot. We were so close to that family that if ever my parents had to leave the city for some reason and we couldn’t bunk school, we would happily stay back in their house. My parents were rest assured that we were in safe hands and for me and my brother it was like vacation time. Having spent my early years in this Maharashtrian household, much of my tastes and preferences have been influenced by their culture and food habits. While there were innumerable dishes that were prepared in their house which are my favorite even today, Masala Doodh is something that stands out in my memories. Like I said before, this is an exotic blend of dry fruits and spices which gives ‘drinking milk’ a whole new meaning. All one needs to do is to add a few spoons of this homemade milk masala and sugar to warm milk. It’s a truly comforting drink ideal for cool weathers than summers. My neighbor would prepare this milk masala fresh in her house and share some with my mom every time. 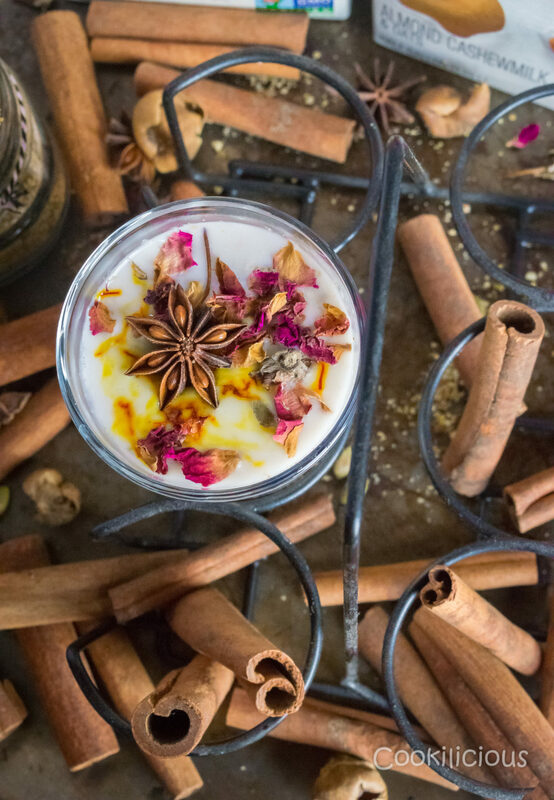 My mom would give us this warm Masala Milk every night before bedtime so we could sleep soundly. This nutritious drink is very beneficial for growing kids. Normally my brother would whine to finish his glass of milk, but this one, he would happily gulp down with no fuss. My parents would have it too because it is really good for health. 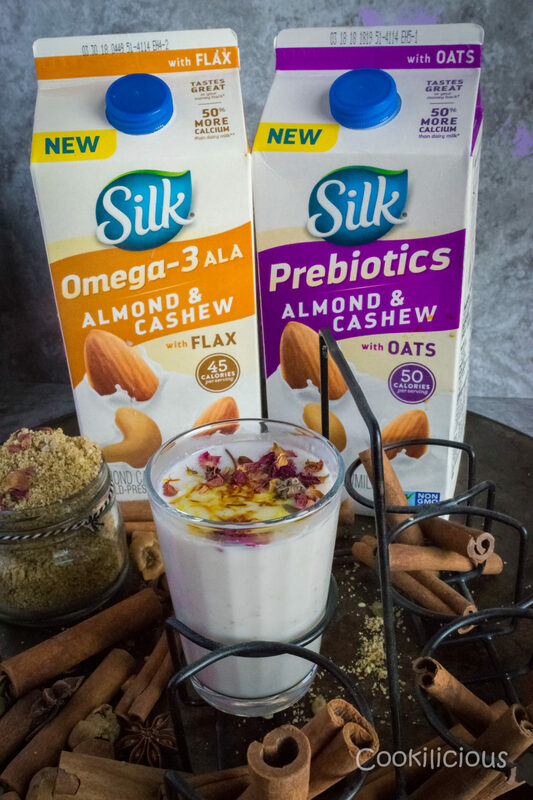 I wanted to make a drink for my vegan readers and what better option than using Silk Almond Cashewmilk Omega 3 which is free of soy, dairy and gluten, has only 45 calories and 3g of sugar per serving and is a good source of Omega-3 ALA . The other one is Silk Almond Cashewmilk Prebiotics which is also free of soy, dairy and gluten, 50 calories with 5g prebiotic fiber and 3g of sugar per serving, not to mention 50% more calcium than dairy milk. 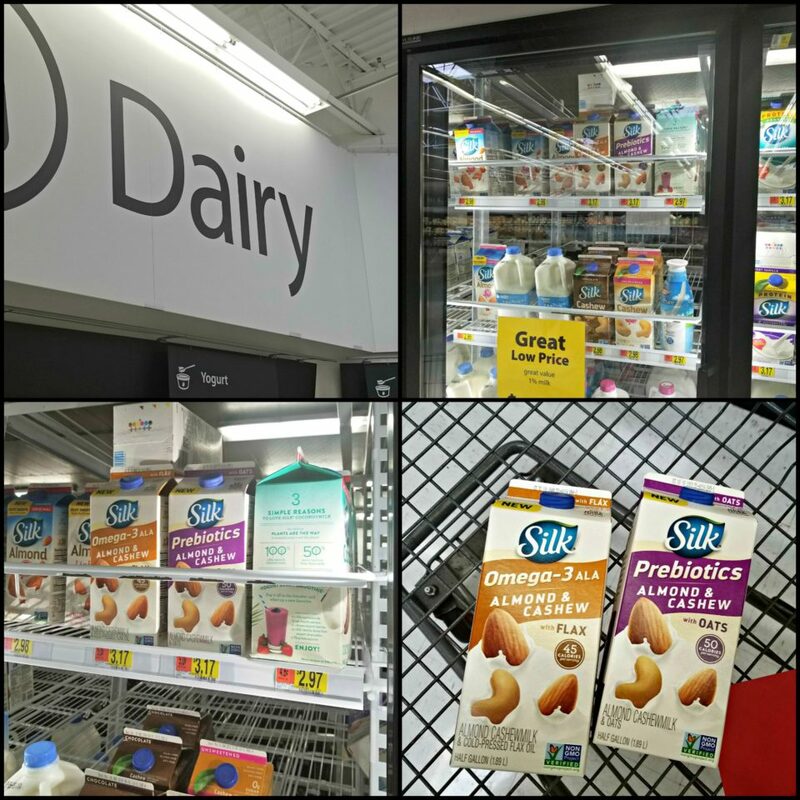 Both of these are the latest flavors from Silk which is a well known diary and lactose free brand in the market and can easily be located in the dairy aisle at Walmart. I read some where that January holds a record for maximum number of resolutions being made which sadly die a silent death in the same month. Most of these are related to fitness goals. I feel staying fit and healthy shouldn’t be so difficult and hard on us. We must seek easier yet effective ways to stay in good shape and that’s where I would like to contribute in my own little way. Using Silk products is a great way to use “Less Dairy-More Plants” and this recipe is a small way to transition to plant based instead of dairy. Substituting this for regular milk is better for you and adding milk masala to it totally elevates the nutrition content and flavor. First you need to dry roast cashews, almonds, pistachios separately. Stir periodically and roast them for about 3-4 minutes. Take off the heat and then roast saffron strands for 20-30 seconds. Next it’s time to roast some fennel seeds, peppercorns and melon/pumpkin seeds. Roast them for 2-3 minutes or until you get a nice aroma of the spices. Turn off the heat. Allow everything to cool down completely. Leave for an hour before grinding everything. Add them all to a blender along with cardamon powder, nutmeg and ginger powder. Grind to a fine powder using the pulse button. The Milk Masala is ready. This milk masala can be made in advance and stored for months (provided you use fresh nuts) in a refrigerator in an air tight container. How to use it? 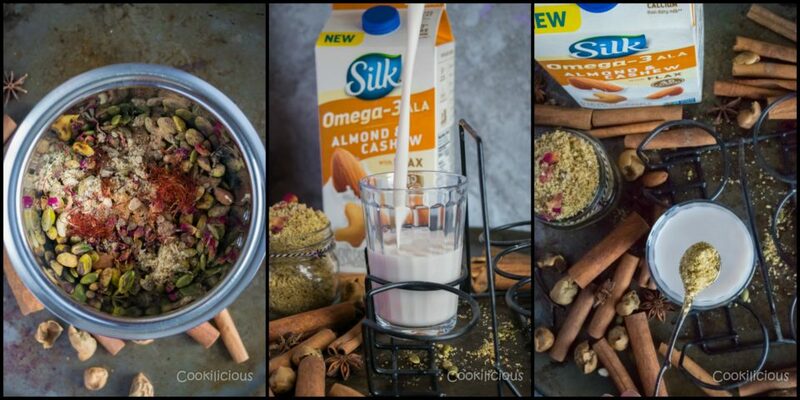 Simple, warm a glass of Silk Almond Cashewmilk Omega 3, add a spoonful of this milk masala and sugar. Stir and serve. Some like this drink warm while some like it cold. You can have this drink for breakfast or make it your last meal of the day. You can also make this your meal after a workout.This beats any store bought protein powder as its made with all natural ingredients and freshly made at home. You can substitute sugar with honey. However, do not add honey to a hot drink. As per Ayurveda, adding honey to hot drinks makes it toxic. It’s best used in colder drinks. You can also add this Masala to desserts, your morning cereal, smoothies and other drinks. Get creative! Milk masala is an aromatic dry powder that is added to milk to make it more flavorful and healthy. 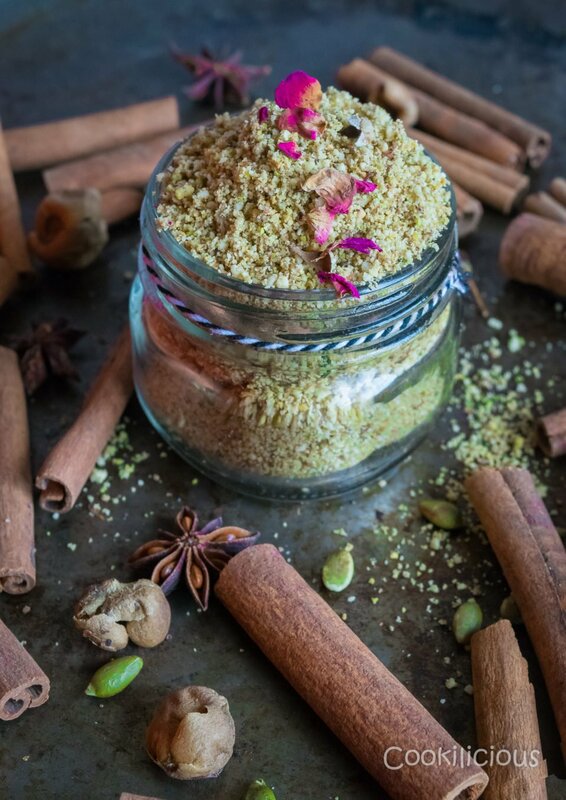 This milk masala is made with different dry fruits and spices like almonds, cashews, saffron, pistachios, peppercorns, etc. This masala doodh/milk is best for winters and is often consumed warm. First you need to dry roast cashews, almonds, pistachios separately. Stir in interim and roast them for about 3-4 minutes. Take it off the pan and then roast saffron strands for 20-30 seconds. Next its time to roast the fennel seeds, peppercorns and melon/pumpkin seeds. Roast them for 2-3 minutes or till you get a nice aroma of the spices. Take it off the pan. Allow everything to cool down completely. I left it for an hour before grinding it. 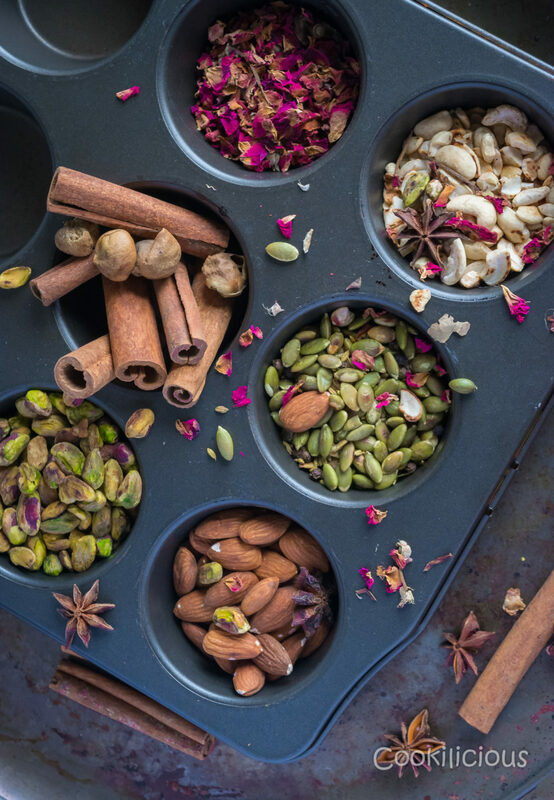 Add them all to a blender along with cardammon powder, dried rose petals, nutmeg and ginger powder. Grind it to a fine powder. Milk Masala is ready. This milk masala can be made in advance and stored for months in a refrigerator in an air tight container. How to use it? Simple, warm a glass of Silk Almond Cashewmilk Omega 3, add a spoonful of this milk masala and sugar. Stir and serve. Some like this drink warm while some like it cold. You can substitute sugar with honey. However, do not add honey to a hot drink. As per Ayurveda, adding honey to hot drinks makes it toxic. Its best used in colder drinks. Click here for more #samesilkysmoothtaste inspiration! 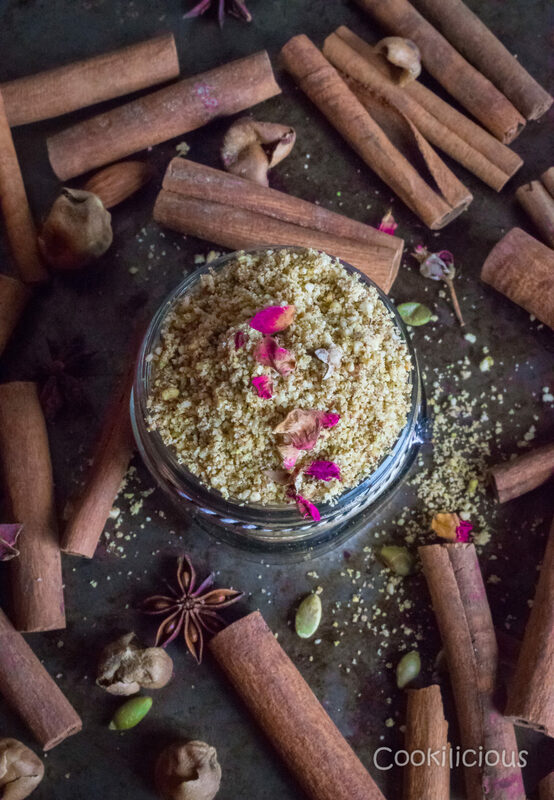 These are some other kitchen essentials that will serve you well in your kitchen – Sesame Seed Powder/Ellu Pudi, Dhania Jeera Powder, Turmeric Powder, Organic Almond Milk, Flavored Baked Croutons, Spicy Tomato Butter, Turmeric Latte, Blueberry Jam and Garam Masala. This looks so flavorful and healthy! I love that it’s vegan. What a delicious sounding beverage! I’ve never heard of it before but the fruity, nutty taste would be a great before-bed drink. I can see why you liked visiting your neighbor if you got treated so special. This sounds like a great vegan option! Looks delicious love the addition of spices you used in the almond milk.